Ciel Halligan, aura adaptor extraordinaire, has a lot of experience filling in for her clients--as them. A rare genetic quirk gives her the ability to absorb human energy and project it back out in a flawless imitation. She's hard at work, posing as a well-known and celebrated astronaut, about to make a stunning announcement on behalf of the space program...when the photographer documenting the job sees right through her aura. Worse, it soon becomes apparent that he not only knows Ciel's not who she's supposed to be, but means her harm. When Ciel's elderly Aunt Helen--also an aura adaptor--is murdered in Central Park, and the same photographer shows up at the funeral, Ciel starts to feel even more exposed. Then more adaptors are killed in the same way, and she becomes terrified her friends and family are being systematically exterminated ... and it's starting to look like she's the ultimate target. She turns to Billy Doyle, her best-friend-turned-boyfriend, for help, but when an unexpected crisis causes him to take off without a word, she's left to rely on her not-so-former crush, CIA agent Mark Fielding. LINDA GRIMES is a former English teacher and ex-actress now channeling her love of words and drama into writing. 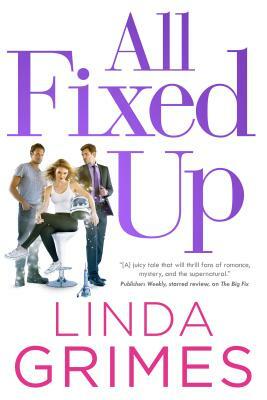 Her books include In a Fix and its sequel Quick Fix. She grew up in Texas and currently resides in northern Virginia with her husband.